ATLANTA - Japan is considering sweetening the pot for U.S. rice farmers in a bid to reach agreement on the Trans-Pacific Partnership, a source close to the matter said Monday. As talks resumed on Saturday between the United States, Japan and 10 other countries negotiating the bloc in Atlanta, Washington and Tokyo remained at odds over rice imports, a heavily protected staple in Japan. Tokyo earlier proposed a 70,000-ton tariff-free annual import quota for U.S. rice under the trade pact talks, but that was far short of the 175,000 tons demanded by U.S. officials. Tokyo is now looking at a proposal where it will allocate 50,000 tons for medium-grain rice within an existing 770,000-ton quota for all rice imports set under an earlier multilateral trade agreement, the source said. The allocation would benefit U.S. farmers. Japan currently imposes 778 percent tariffs on rice to protect local farmers. But following the Uruguay Round of global trade talks under the General Agreement on Tariffs and Trade framework through 1994, it created a 770,000-ton tariff-free “minimum access” rice import quota. U.S. rice accounted for some 360,000 tons of the 770,000 tons in fiscal 2014. U.S. farmers are likely to make up most of the 50,000 tons that would be allotted to medium-grain rice, boosting American rice imports to Japan while squeezing allocations from other countries such as Thailand, China and Australia. The idea was taken under consideration as the Japanese minister in charge of TPP negotiations prepared to attend ministerial talks from Wednesday in Atlanta. 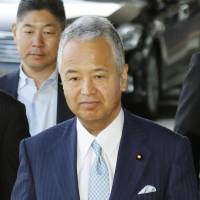 Economic and Fiscal Policy Minister Akira Amari, who is in charge of TPP discussions for Japan, told reporters ahead of his departure that agreement must be reached at the meeting to keep negotiations from dragging on without progress, as they have for months. He said they might otherwise take years to conclude. Some countries believe a deal must be struck ahead of the general election in Canada next month and before the national focus in the United States shifts later this year to the 2016 presidential election. Such political events will make it hard for politicians in those countries to concentrate on TPP issues, analysts said. Major sticking points such as intellectual property protection and automotive trade prevented ministers from wrapping up negotiations in the previous round in Hawaii in July. The TPP negotiations were launched in 2010 and involve the United States, Australia, Brunei, Chile, New Zealand, Peru, Singapore and Vietnam. Malaysia, Mexico, Canada and Japan joined the talks at a later date.